Review of Anderson Valley Brother David’s Triple | Beer Apprentice - Craft Beer News, Reviews, Interviews and Info. Hello everyone. For today’s craft beer review I’m going to be trying the Brother David’s Triple brewed by the Anderson Valley Brewing Company situated in Boonville, California. Trippels are one of my favorite styles and I’ve always enjoyed the brews that I’ve tried from Anderson Valley, so this should be an excellent pairing between brewery and style. When checking the website, avbc.com, I stumbled upon this description. Trippel. Similar to Belgian-style Strong Pales, this beer is often characterized by its lighter color, spicy aromatics, and complexity. Brother David’s Triple is brewed with copious amounts of pale malts as well as Belgian candi sugar, giving it a deep golden hue, medium body and rich mouth feel. The dense head gives off aromas of candied orange peel, clover honey, pears, and a hint of freshly mown fields. The fruity esters and spicy hop flavors balance the phenolic characteristics leading to a peppery, citrusy finish. This brew came in a 25.4 oz. bottle with an ABV of 10.0%. It poured a very pristine and beautiful color. It was a clear, golden orange shade with golden yellow highlights around the edges of the chalice. From a decently aggressive pour the crown was small and fizzy. It dissipated rather quickly also. A little bit of lacing was left behind, but not much to be honest. The aroma delivered tones of lemon citrus and lemon grass infused with hints of pepper and yeast. Some breadiness was detected too. Further into the rather complex nose were wafts of banana and green apple. Even though the fragrance was intricate, I thought it to be very mild. None of the characteristics really “popped” nor was the alcohol identified. Man, I was way off from their description, wasn’t I? Oh well, still not bad. The flavor was similar to the aroma for sure. Lemon citrus and lemon grass intertwined with some white bread, green apple skins and subtle banana. To be truthful, it almost had a wheat beer type of taste. Some alcohol was noticed at the back end, however it disappeared after a few sips. The mouthfeel was medium bodied. Dry, kind of spritzy and crisp. It was even somewhat refreshing for a 10% beer. The carbonation was of medium to high strength and a very minute amount of warmth was felt in my chest. A decent bit of flavor was left behind between sips though. Well, this was an ok beer for sure even though I found hardly any of the characteristics that Anderson Valley listed in the commercial description. Maybe my nose and palate are broken. Still, it’s easily worth a try if you happen to see it. The drinkability was pretty good too. Now, don’t get me wrong, it’s not a beer to just turn up and pound, but for its size I had absolutely no trouble at all in finishing this bottle all by myself. 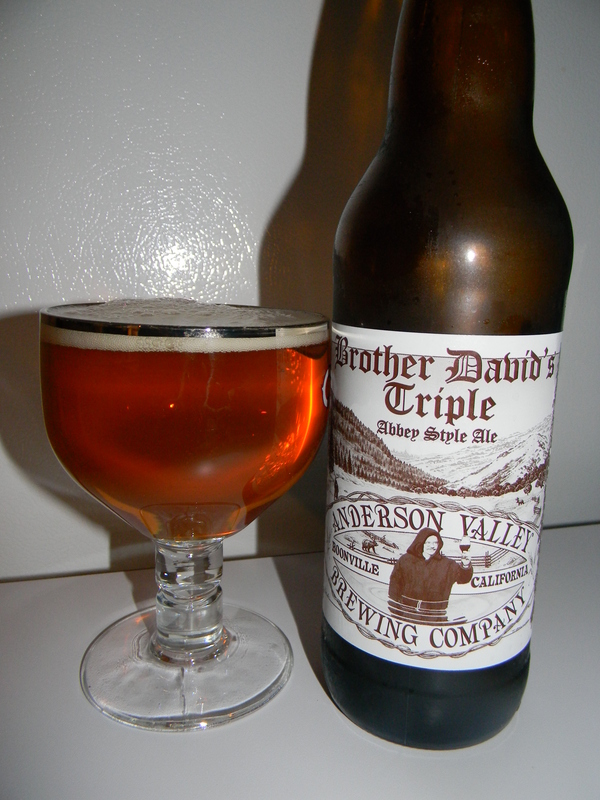 I don’t think the Anderson Valley Brother David’s Triple is quite on par with some of the other Belgian Trippels that I’ve had in the past, but it does represent the style fairly well. I’d, no doubt, drink it again. Have any of you folks ever had this beer? What did you think about it? Feel free to leave me a comment and tell me of your opinion. I’d love to hear from you.